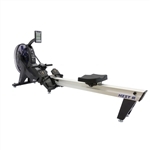 First Degree Fitness Horizontal Pacific Challenge AR Indoor Rower, the Pacific Challenge AR Indoor Rower is designed for recreational rowing enthusiasts. If you are searching for a good looking, functional piece of fitness equipment that can offer an all round total body workout, the Pacific Challenge AR Indoor Rower is perfect. Designed to inspire all levels of fitness, this indoor rower offers low impact, intuitive movement at an affordable price point. If you love a fitness challenge you will appreciate the adjustable fluid resistance technology that is unique to FDF’s indoor rowing ergometers. Delivering a broad range of rowing resistance levels, the Pacific Challenge AR will inspire you to push your limits while experiencing the sight, sound and feel of real on-water rowing. Cardio at home has never been so simple, the built in transit wheels make the Pacific Challenge AR Indoor Rower simple to move around and store away in the vertical position when finished. Tank: 4 Levels of Variable Fluid Resistance Technology Allows Resistance Change From MIN to MAX at the Turn of a Dial. FDF’s Unique Triple Bladed Impeller and Baffled Tank for Instant Catch and Consistent Resistance Throughout the Whole Stroke.